Data center requirements are shifting as the business environment evolves to leverage new technologies. Organizations are turning to multicloud environments comprising a mix of private cloud, public cloud, and on-premise infrastructure to best address their unique needs. Understandably, this shift is putting a renewed emphasis on security, automation, orchestration, and agility. IT leaders are responding by building and deploying multicloud data center networks that leverage automation and software-defined networks (SDN) as a cost effective means of providing dynamic network control. Of course, while many organizations are recognizing the need for a data center upgrade, not all have the same drivers. All, however, need to make a business case for the investment. 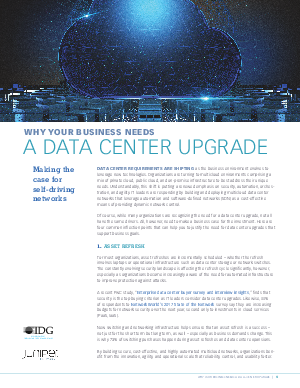 Here are four common inflection points that can help you to justify the need for data center upgrades that support business goals.